Karomber Lake is in Boroghil Valley which is a sub-valley of Chitral. A drive of 12-14 hour takes one from Islamabad/Rawalpindi to Chitral city and another drive of 4-5 hours takes you to Mastuj. Mastuj is the base for Boroghil treks. The road ahead is jeep drive of 10-11 hours till Ishkarwaz. If the road is blocked (normally due to the overflow of the river) then jeep goes till a point ahead of Lasht and then few hours of trek till Ishkarwaz. From there it is 2 or 3 days trek till Karomber Lake depending on your convenience. 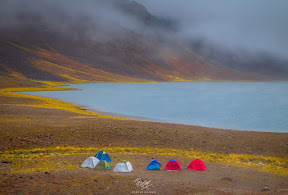 Main campsites are Ghrail, Lashkargaz, Sheorsheer and Laleerabad. March 23, 2017, 6:38 a.m.